Ever since Cave Story and Mega Man 9 jumpstarted the retro-revival scene in gaming in the mid-2000’s, many titles have been created that call back to retro consoles from the 8 and 16 Bit eras. Kickstarter has also been home to many of these games, with one of its biggest successes being 2014’s Shovel Knight. One part of gaming history that has been ignored much more by developers recently are titles from the PC home computers of the 8 and 16 bit eras, like the MSX, ZX Spectrum, and in Tower 57’s case, the Amiga. These platforms are home to quite a few exciting classics like the original Metal Gear, Jetpac, and Alien Breed, but have just been overshadowed by the juggernauts that are the NES, SNES, and Sega Genesis. When Pixwerk brought Tower 57 to Kickstarter in 2015, they aimed to pay tribute to overshadowed top-down shooter Amiga classics like Alien Breed and The Chaos Engine, and after playing the final product, I can say they were successful at that. Tower 57 can be quite rough around the edges, as it is short, still contains a few bugs and glitches to varying degrees of annoyance, and isn’t as fun to play in single-player. That being said, Tower 57 sports some of the best looking and most detailed pixel art that I have seen this year and should scratch the itch of anyone looking for a new bombastic top-down shooter to play. Like many retro games, and surprisingly 2016’s DOOM, Tower 57 does take place in an exciting world with a bit of lore for players to sink their teeth into, but players can choose to ignore it for the most part in favor of gameplay. The gist of things is that the world is populated by gigantic towers that are hundreds of stories tall and house their own cities, factories, and almost anything else you can think off (including dinosaurs). At the beginning of the game, players show up at the titular Tower 57 with virtually no memory of where they came from, outside of the fact that they are agents of __ and are working for an entity called Mother to cleanse the tower of its corrupt leaders. Like I mentioned before, you can ignore Tower 57’s story for the most part and still have an enjoyable time with the game. The story is nothing spectacular, but the game takes place in an interesting enough world and has exciting enough lore, so the entire adventure doesn’t feel meaningless. Tower 57 worries about its story just as much as it needs to to keep the action going, and tries to put in the effort where it counts for games of this style: graphics and gameplay. The game’s pixel art aesthetic was crafted by developer Thomas Feichtmeir and is a treat to look at. 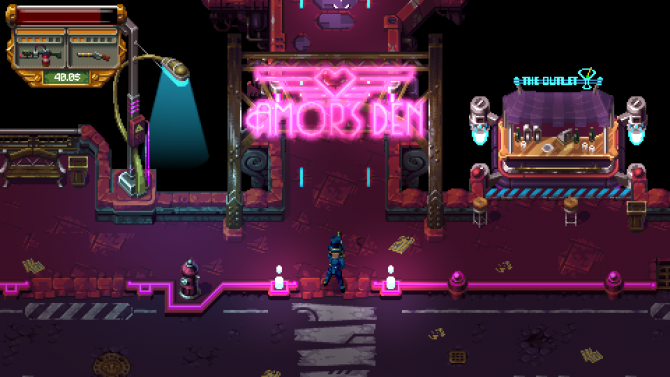 From the neon-soaked hub of Amor’s Den to sewers and dinosaur filled science labs, the game does a great job of staying true to the classics it’s inspired by while also realizing each area of the tower visually with detailed NPC’s, enemies, and objects. As you can see in the gif above, the game’s environments flow exceptionally well and dynamically for the most part, so the developers could make each area of the game look and feel as unique as possible. Tower 57’s environments are also highly destructible, so the world does seem to look impacted by the bevy of bullets and special abilities you unleash onto it. I did run into a few small visual glitches when the game was trying to showcase two floors of a building at the same time, but the game looks excellent otherwise that I can overlook that minute problem. If you are a huge fan of pixel art, Tower 57 is an impressive looking title worth checking out. The gameplay, while fun for the most, does have noticeable flaws in a few areas. At the start of the game, players can choose to create a team of three from six different heroes. These all differ wildly, from a tommy-gun wielding mafia Don to Abraham Lincoln lookalike with a flamethrower. Each character has their unique weapon, an adaptable sub-weapon, and a unique screen-clearing special ability. I found every character in Tower 57 fun to use, so players should have a good time no matter what their team composure is. 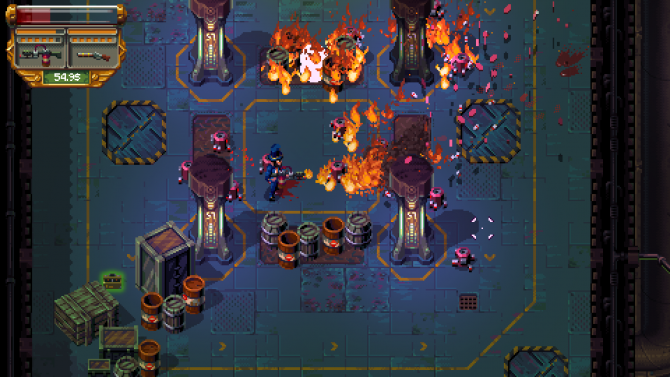 Unlike the retro games it’s based on, Tower 57’s environments are not procedurally generated. While this may take away a bit of reply ability, it still rewards multiple playthroughs so players can find all of the game’s secrets. Levels can be large and maze-like, but an easy to use the map and the lack of procedural generation means players will likely always know where they are and where they need to go. The game can be very hard, especially when playing alone, but those aforementioned things prevented it from ever getting frustratingly tricky. As player fight their way through each level’s different enemies and bosses, it is possible for players to lose a limb. If this happens, players must either switch the character they are playing as or find a machine to restore said limb. Players can also upgrade other body parts at these computers to gain things like more help. Players can even upgrade weapons to make them more powerful and by health and ammo refills at certain places. If one of the player’s three characters dies, players will have to revive them with an orb, which can be found hidden in the game’s environments or purchased for a lot of money at a vendor in the game’s hub world Amor’s Den, which is also home to a variety of different shops for players to spend money at and gambling minigames for players to make money with. Unfortunately, this engaging sounding setup doesn’t work as well in execution in single-player. Quite a few of the game’s mechanics, like the limb losing mechanic, are made better in multiplayer. Players can see all six characters in action when playing, carry characters around and defeat bosses easier and quicker when playing with a buddy. 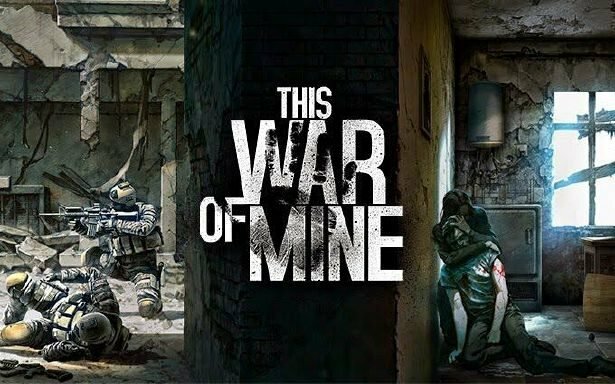 This ends up leaving the game feeling somewhat unfulfilling when playing in single-player, though it seems like the game is touting that it can be equally enjoyable as both. I also ran into some noticeable glitches in my time with Tower 57. I would occasionally get stuck in an object in the environment or get caught in an unbeatable situation due to my character’s location at certain checkpoints, causing me to have to reload earlier saves. The game is quite short too, and should only take players around 3-6 hours depending on difficulty and knowledge of the level. While the game’s low cost does make up for this somewhat, I was left wanting more to do, which is a double-edged sword for Tower 57. 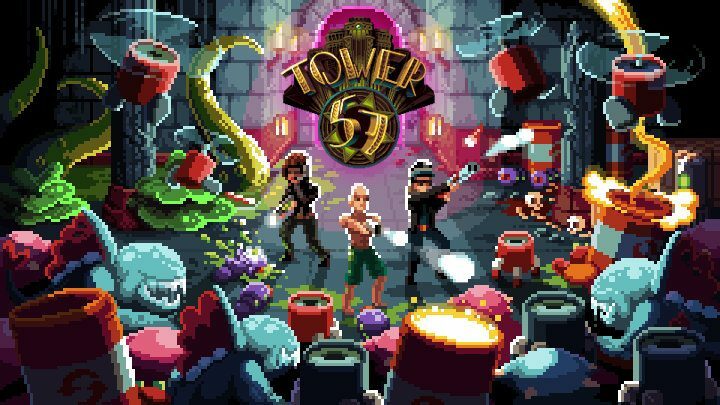 If you are a fan of pixel art or Amiga-style twin-stick shooters, you will probably have a nice time with Tower 57, especially if you are playing with a friend. Unfortunately, if you are playing in single-player, the title’s flaws become a lot more noticeable and annoying, leaving me tepid wanting. If the game was polished up a bit more and made its way to a co-op friendly console like the Nintendo Switch, I could recommend it more, but as it stands, Tower 57 is best suited for those I mentioned above.